Learn more about combining filters and filter groups to segment your list. Segmenting your email list allows you to group contacts based on a single or set of criteria. Apply a filter to your message to target a single group of contacts, or combine these segments to message multiple segments in one message. When combining multiple filters there are two different options: combining individual filters and combining filter groups. Combining individual filters takes your entire contact list and narrows that list down by excluding those that do not meet the criteria of your filter. For example, if you wanted to send an email to the segment of your marketing list that has: opened an email after January 1, 2018 and purchased from you in the last 60 days, you could combine two individual filters. Follow the below steps to set up an example. 1. Navigate from the home menu to Authoring. 2. Select a Message, or create a New Message. 3. Navigate to the Segmentation Filter Settings section. 5. Select System Fields from the first drop-down (open date is automatically tracked by Listrak). 6. 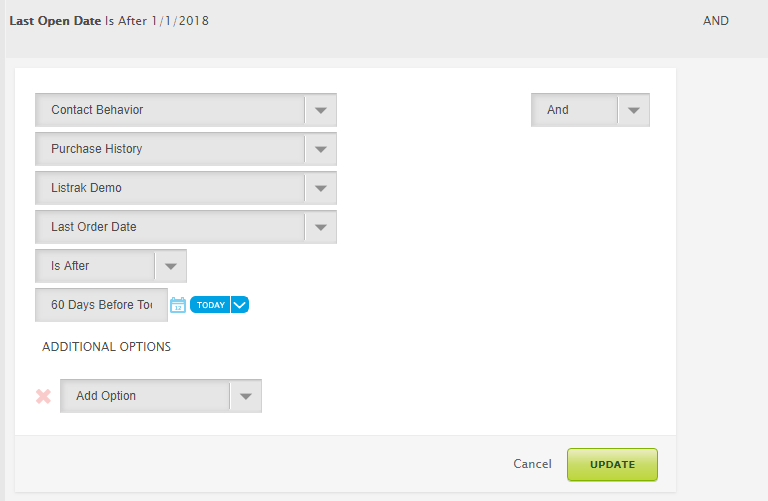 Select Last Open Date from the second drop-down. 7. Then, select Current List because you only want to view those who have opened a marketing email on the current list. 9. Use the calendar icon or enter 01/01/2018 in the input field. Next, select how to combine the filters. The drop-down to the right of the filter builder allows you to combine filters. Learn more about the operators available when combining filters here. In this example, you want both of the filters to apply to the contacts being sent the email. The operator is selected to AND by default. Then, add the second filter. 12. Select Contact Behavior from the drop-down menu. This filter is based on when a contact has purchased. 14. Select Last Order Date from the next drop-down. This allows you to narrow down contacts based on when they purchased from you most recently. 15. Select Is After from the operator drop-down. 16. Click the offset arrow. 17. Enter 60 to the blank. 18. Click OK. This generates only a list of contacts who's last order date was in the last 60 days. Filter groups function like the parenthesis in a math problem. They allow you to specify the actions that apply to some of the contacts you wish to send to, but may not apply to all contacts. For each of these unique actions that apply to a subset of your target, you would build a filter group. For example, one group of contacts is the recent purchasers who have opened an email that we built above. You may also want to send to those who are located near your retail store in New York and have purchased from you. The contacts who reside in New York do not have to have opened an email in 2018 to be included in this filter. 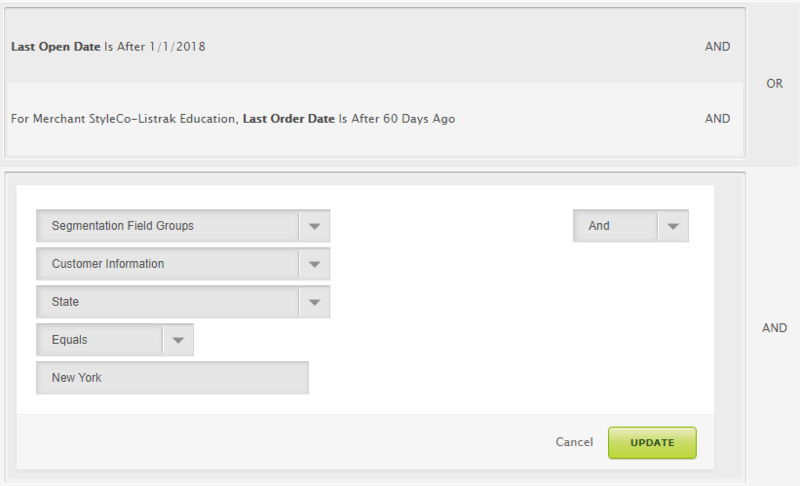 Use filter groups to apply a subset of specific criteria to a group of contacts. Next, begin adding filters. Add a filter group that includes all of the contacts who opened and purchased above. 5. Click Cancel. By default, the Edit Filter button adds an individual filter. 6. Click New Filter Group. 7. Update the operator drop-down to OR, since contacts must fit in one group or the other. 9. 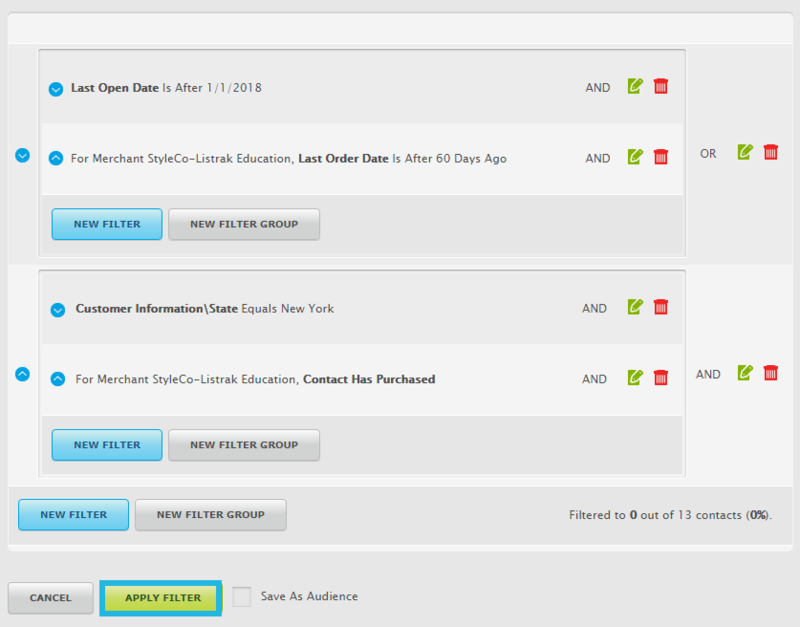 Click the New Filter button in the nested group. 10. Follow the steps to add the first and second filter above. Next, add the second filter group. 11. Click the bottom New Filter Group. 12. Leave the operator as AND because no filter group follows this group. Then, begin adding the specific filters to our group. 14. Click New Filter in the group that was just created. 15. Select Segmentation Field Groups from the segment type drop-down menu. 18. Select Equals as the Operator. NOTE: You must be collecting the State a customer lives in order to build the above filter. The next step is to combine the filters. In the second filter group, send an email to those contacts who live in New York and have made a purchase from us. We'll leave our operator as AND since both conditions must be true. 21. Click New Filter following the New York Filter. 22. Select Contact Behavior from the segment type drop-down menu. This filters on purchase activity. 23. Select Contact Has Purchased from the next drop-down menu. This ensures the contacts have purchased from you. 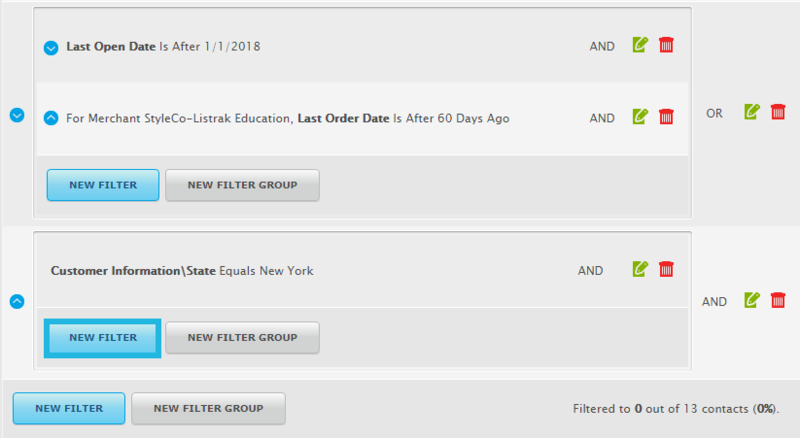 Congratulations, you've just added a filter to your list using filter groups! This message will send to a contact if they fit into one of the two groups: opened an email in 2018 and ordered in the last 60 days or live in New York and have purchased from you at any time.